After a couple of weeks in the gym, the first Leinster XV of the preseason took to the field at the Stade Aimé Giral. Since we only got to watch via a Leinster fan holding up their phone using Periscope, we decided against doing a full writeup (so I'll link to the official Leinster site), but despite the defeat it seemed to be a good run out for the young selection. PS - point of interest...while James Ryan was involved in Leinster's preseason, as you can see below, he wasn't used against USAP so even that stands to his winning record! Replacements used: P Timmins, N Reid, B Daly, H Keenan, C Rock, O Heffernan, O Dowling, V Abdaladze, S McNulty. 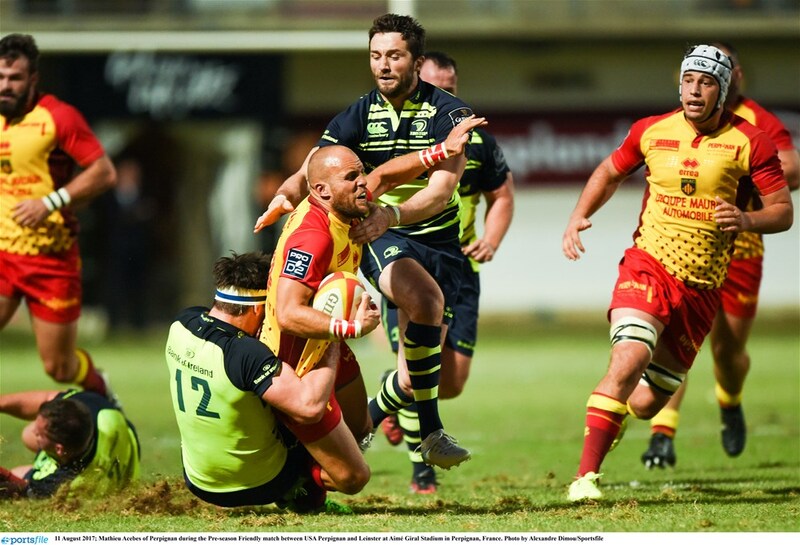 "...once again this practice of playing one of Leinster's preseason fixtures in a club ground was a success, as Friday's crowd seemed every bit as large and enthusiastic as that which went to Navan RFC around this time last year." LEINSTER: Rob Kearney (Jordan Larmour ht); Hugo Keenan, Adam Byrne (Ian Fitzpatrick, 65), Isa Nacewa (capt, Fergus McFadden ht), Dave Kearney (Barry Daly ht); Ross Byrne (Cathal Marsh 60), Jamison Gibson-Park (Charlie Rock 49); Peter Dooley (Ed Byrne 60), Bryan Byrne (Sean McNulty 60), Michael Bent (Vakh Abdaladze 65), Ian Nagle (Mick Kearney ht), Scott Fardy (Oisin Dowling 60), Josh Murphy, Jordi Murphy (Will Connors ht), Max Deegan (Oisin Heffernan 72). "...even when the play was over the far side of the pitch and I needed my trusty binoculars all I could see at every breakdown were blue jerseys adorned with 6, 7 or 8 heavily involved in all that was positive for Leinster." "Isa was everything Leinster needed at each moment he was involved. Crash ball? Grubber past rushing D into their 22? Neat offload? Force a turnover? Clear out? Key scrambling tackle? Those are only some of the boxes he ticked on the day. " LEINSTER: R Kearney; A Byrne, R O’Loughlin, I Nacewa (capt), J Larmour; R Byrne, J Gibson-Park; C Healy, S Cronin, M Bent; D Toner, S Fardy; D Leavy, J Van der Flier, M Deegan. Replacements: E Byrne for Healy, J Tracy for Cronin, A Porter for Bent (all 50 mins), J Conan for Deegan (55 mins), J Ryan for Toner (59 mins), N McCarthy for Gibson-Park (61 mins), B Daly for Larmour (67 mins), C Marsh for R Byrne (72 mins). "Pick a matchday 23 for the province and any team in Europe would be more than happy selecting a 6, 7 and 8 from the players you left out. It gets to a point where you almost forget to focus on the individuals themselves, yet Conan's display on Friday certainly got your attention." LEINSTER:R Kearney (rep: B Daly, 40); A Byrne, R O’Loughlin, I Nacewa (c), J Larmour; R Byrne, L McGrath (McCarthy., ; C Healy (rep: Byrne, 52), J Tracy (rep: Cronin, 52), M Bent (rep: Porter, 52), D Toner, S Fardy (rep: Kearney, 73), R Ruddock (rep: Leavy, 58), J van der Flier, J Conan. "after three rounds we are the only team with 15 points out of 15, we have the second-highest amount of points scored...and we have the best defence. I'm not using those stats to say we're perfect by any means, but let's just say my starting point has to be with the positives." Leinster: 15 Joey Carbery, 14 Adam Byrne, 13 Rory O’Loughlin, 12 Noel Reid, 11 Dave Kearney, 10 Ross Byrne, 9 Luke McGrath, 8 Jack Conan, 7 Jordi Murphy, 6 Rhys Ruddock (captain), 5 James Ryan, 4 Ross Molony, 3 Andrew Porter, 2 Seán Cronin, 1 Ed Byrne. Replacements: 16 James Tracy, 17 Cian Healy, 18 Michael Bent, 19 Mick Kearney, 20 Josh van der Flier, 21 Nick McCarthy, 22 Cathal Marsh, 23 Jordan Larmour. "you only need look at the Cheetahs' opening try from William Small-Smith to see how important it is to have an airtight 12/13 channel. I had hoped Isa starting at 12 would give us that bit of experience and leadership we needed to keep it so, yet...he was forced to leave the field as early as the 17th minute"
writeup - "LEINSTER STANDARD TIME"
Leinster: J Carbery; D Kearney, N Reid, I Nacewa (c) (rep: O’Loughlin, 17), B Daly; R Byrne (rep: Marsh, 74), J Gibson-Park (rep: McCarthy, 61); C Healy (rep: Dooley, 50), J Tracy (rep: Murphy, 56 (rep: Deegan 71)), M Bent (rep: Porter, 50); R Molony, M Kearney (rep: Ruddock, 51); J Murphy (Cronin, 51), J van der Flier, J Conan. "In my preview I highlighted our soft centre for the umpteenth time. Both Noel Reid and Rory O'Loughlin did some good things in this match but each time they did, it seemed to get cancelled out by something potentially costly moments before or after." writeup - "COCKERS & MUSCLES"
LEINSTER: J Carbery; F McFadden, R O’Loughlin, N Reid (rep: Larmour, 59), D Kearney; J Sexton (c) (rep: R Byrne, 69), L McGrath (rep: Gibson-Park, 65); J McGrath (rep: B Byrne 59), S Cronin (rep: E Byrne, 59), T Furlong (rep: Porter, 59); D Toner, S Fardy; R Ruddock, J Murphy (rep: Molony, 75), S O’Brien (rep: Deegan, 59). "The opening six weeks of the new-look league have gone pretty much as expected...much entertainment with much confusion thrown in as well. But now it's time to step up a gear..."
writeup : "THRILLS? MEH. SPILLS? WELL..."
LEINSTER: 15. Joey Carbery, 14. Adam Byrne, 13. Rory O’Loughlin, 12. Robbie Henshaw, 11. Barry Daly (Fergus McFadden 70′), 10. Johnny Sexton (captain) (Ross Byrne 76′), 9. Luke McGrath (Jamison Gibson-Park 61′); 1. Jack McGrath (Cian Healy 48′), 2. James Tracy (Sean Cronin 48′), 3. Tadhg Furlong (Michael Bent 48′), 4. Devin Toner, 5. Scott Fardy (Ross Molony 69′), 6. Rhys Ruddock (Jordi Murphy 61′), 7. Josh van der Flier, 8. Jack Conan. "Even if time can't help lighten the load of our injury list, the coaching staff have shown they can make really good use of the resources at hand. It's a pool that's tough for sure, but not just for us by a long shot." LEINSTER: 15. Joey Carbery, 14. Adam Byrne, 13. Robbie Henshaw, 12. Isa Nacewa (captain) (Noel Reid 35’), 11. Barry Daly (Fergus McFadden 79’), 10. Ross Byrne, 9. Luke McGrath (Jamison Gibson-Park 63’); 1. Jack McGrath (Cian Healy 47’), 2. James Tracy (Sean Cronin 47’), 3. Tadhg Furlong (Michael Bent 63’), 4. Devin Toner, 5. James Ryan (Ross Molony 63’), 6. Rhys Ruddock, 7. Josh van der Flier (Jordi Murphy 63’), 8. Jack Conan. "The pundits were obsessed with the fact that as a team we missed 34 (tackles) against Montpellier's monsters last week, and referred to it every time we missed one this time around. Yet despite this apparent failing, we somehow managed another bonus point try win, ironically posting 34 points in the process." LEINSTER: 15. Joey Carbery, 14. Fergus McFadden, 13. Robbie Henshaw, 12. Noel Reid, 11. Barry Daly (Dave Kearney 41’), 10. Johnny Sexton (Ross Byrne 68’), 9. Luke McGrath (Jamison Gibson-Park 62’); 1. Cian Healy (Jack McGrath 50’), 2. Sean Cronin (James Tracy 50’), 3. Tadhg Furlong (Michael Bent 68’), 4. Devin Toner, 5. Scott Fardy (James Ryan 55’), 6. Rhys Ruddock, 7. Josh van der Flier (Dan Leavy 50’), 8. Jack Conan. "It's not much good calling for the ball if you don't have a plan to do something with it, and it seems that Seanie knew exactly how to exploit the numbers matchup that faced him in the wide channel. Cool as you like he sets off letting go a pass to Adam Byrne in support at just the right moment"
Leinster: Rob Kearney; Adam Byrne, Rory O’Loughlin, Noel Reid (Joran Larmour ’2), Dave Kearney, Ross Byrne (Cathal Marsh ’77), Jamison Gibson-Park (Luke McGrath ’55): Jack McGrath (Cian Healy ’47), James Tracy (Richardt Strauss ’66), Tadhg Furlong (Andrew Porter ’60), Devin Toner, James Ryan (Ross Molony ’12), Dan Leavy (Jack Conan ’56), Jordi Murphy, Seán O’Brien. "I'd be more concerned about whether or not we have the versatility in our game to match [or at least counter] the open type of rugby that brought success for Glasgow, Connacht and Scarlets in recent seasons, particularly if our squad goes into the playoffs on the back of tough European and Six Nations campaigns." writeup : "MARKS OUT OF TEN"
Leinster: Jordan Larmour; Adam Byrne, Rory O’Loughlin, Conor O’Brien ( Hugo Keenan, 72‘), Dave Kearney; Ross Byrne (Cathal Marsh, 72‘), Jamison Gibson-Park ( Nick McCarthy, 51‘); Ed Byrne ( Peter Dooley, 51‘), Seán Cronin (Richardt Strauss, 58‘-64’), Michael Bent ( Andrew Porter, 51‘), Ross Molony (C), Mick Kearney ( Dan Leavy, 35‘), Scott Fardy, Jordi Murphy |(sin bin: 16’-26’, Josh Murphy, 69‘), Max Deegan. "From the restart we set up a maul which had us instantly on the front foot...then a pass to Jordan Larmour was a bit high yet he made it work before skipping past flailing tacklers and offloading to a steamrolling Sean Cronin. Enter Ross Byrne again who plants a perfect kick pass over to the far touchline for McFadden to recover and he has Deegan in support to provide the finish. An outstanding team try..."
writeup : "SMOTHER OF DRAGONS"
Leinster: Jordan Larmour, Fergus McFadden Rory O’Loughlin, Noel Reid; Isa Nacewa (Conor O’Brien ’54); Ross Byrne (Cathal Marsh ’60),.Jamison Gibson-Park (Nick McCarthy ’55): Ed Byrne (Peter Dooley ’48), Seán Cronin (Richardt Strauss ’48), Michael Bent (Andrew Porter ’49); Ross Molony ((Ian Nagle ’8 (Jack Conan ’67)), Scott Fardy; Josh Murphy, Jordi Murphy, Max Deegan. "There's something about his body language that just exudes confidence - 'I have the ball now and I'm going to make something happen' - and once the early cobwebs were brushed off he was able to back up that swagger to play a large part in his new team bagging a very handy five league points." writeup : "LOWE AND BEHOLD"
LEINSTER: 15. Jordan Larmour, 14. Dave Kearney, 13. Garry Ringrose, 12. Noel Reid, 11. James Lowe, 10. Ross Byrne, 9. Luke McGrath (captain); 1. Jack McGrath, 2. James Tracy, 3. Andrew Porter, 4. Ian Nagle, 5. Scott Fardy, 6. Jordi Murphy, 7. Josh van der Flier, 8. Jack Conan. Replacements: 16. Sean Cronin, 17. Ed Byrne, 18. Vakh Abdaladze, 19. Mick Kearney, 20. Max Deegan, 21. Nick McCarthy, 22. Fergus McFadden, 23. Rory O’Loughlin. "Our first European success was largely thanks to the addition to our ranks of another Australian known for wearing six on his back, and while Fardy is a different kind of player, his importance both on and off the pitch for us cannot be overstated. Having the confidence to trudge through 30- and 40-plus sets of phases needs leadership and he has it to burn. " Leinster: Rob Kearney, Fergus McFadden , Garry Ringrose, Robbie Henshaw, Isa Nacewa (Jordan Larmour ’72), Johnny Sexton (Ross Byrne ’71), Luke McGrath (Jamison Gibson-Park): Cian Healy (Jack McGrath ‘), Sean Cronin (James Tracy ’43) Tadhg Furlong, Michael Bent ’71), Devin Toner, Scott Fardy (James Ryan ’68); Rhys Ruddock (Josh van der Flier ’43), Sean O’Brien, Jack Conan. "We badly needed to make the right changes during the break. Something had to be done differently because the English champions had our number. And what the Cullen/Lamcaster brains trust pulled out the bag was not only just what we needed to take control of the match, it was once again very similar to what our opposition had been doing to us." writeup : "HEADS UP RUGBY"
LEINSTER: 15. Rob Kearney; 14. Fergus McFadden, 13. Garry Ringrose, 12. Robbie Henshaw, 11. Isa Nacewa; 10. Johnny Sexton (Ross Byrne 3’), 9. Luke McGrath (Jamison Gibson-Park 73’); 1. Cian Healy (Jack McGrath 55’), 2. Sean Cronin (James Tracy 55’), 3. Tadhg Furlong (Andrew Porter 73’), 4. Devin Toner (James Ryan 55’), 5. Scott Fardy, 6. Sean O’Brien (Dan Leavy 55’), 7. Josh van der Flier, 8. Jack Conan. "Leinster have had a couple of stumbles this season it's true, but you can't amass an overall record of 13 wins out of 15 [including 4 from 4 in Europe and doubles over teams like Exeter and Munster] without being well prepared. I mentioned the stingy defence already and our 34 points didn't put themselves on the scoreboard, but it wasn't just the tactics that impressed on the day, it was the way the 15 men in blue seemed so match ready from the kickoff." writeup : "...FIGHT LIKE 'L'"
LEINSTER: 15. Jordan Larmour, 14. Barry Daly (Noel Reid 58’), 13. Rory O’Loughlin, 12. Robbie Henshaw, 11. James Lowe, 10. Ross Byrne, 9. Jamison Gibson-Park (Nick McCarthy 75’); 1. Jack McGrath (captain) (Ed Byrne 40’), 2. James Tracy (Richardt Strauss 66’), 3. Michael Bent (Tadhg Furlong 47’), 4. Devin Toner, 5. James Ryan (Mick Kearney 47’), 6. Jordi Murphy (Josh van der Flier 66’), 7. Dan Leavy, 8. Jack Conan.